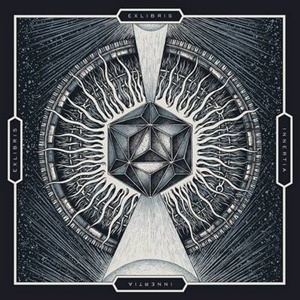 Although active since 2003 with three previous albums under their belt (the last two on Metal Mind Productions), Exlibris are unknown previously to these ears prior to taking in their latest album Innertia. Between the four years since the last release Aftereal, the group has added drummer Grzegorz Olejnik and vocalist Riku Turunen to the mix – adding a Finnish singer to a Polish band. Which in the end shouldn’t come as a shock to the system, as the brand of traditional/ melodic power metal that Exlibris delivers needs that kind of upper tenor presence who can hit the occasional falsetto or scream to match the interplay and songwriting these musicians live for. The band straddle the lines of melodic traditional metal with obvious European power metal propensities – track to track things can shift from a more uplifting affair with thunderous double bass and stirring riffs for “Incarnate” or settle into something slightly more modern in terms of cyber effects against a heavier electric stance on “Multiversal”. You can expect bigger multi-tracked choruses that are Teutonic in nature, almost choir-like against the driving music and sweeping emotional nature of “Harmony of the Spheres” that embraces classic Edguy aspects intertwining the force of Iron Savior or Brainstorm. Keyboardist Piotr ‘Voltan’ Sikora employs a wide birth of sounds from the 70’s Deep Purple/Rainbow outlook all the way through to a pomp and circumstance angle that Sonata Arctica made infamous – unafraid to take the lead if necessary or sit back and provide the orchestral foundation to bring the arrangements alive. Riku sits in that Helloween/Edguy class of singers – natural to soar, comfortable going up and down his register and back again, as “Gravity” and the theatrical bombast meets Rainbow/Dio drive throughout “Thunderbird” illustrate the versatility of his melodies. Because the band possess obvious knowledge in more than just the power and traditional metal genres, Innertia will impress due to the ability to float in and out these progressive, symphonic, and modern nuances without losing the flow and style Exlibris find comfortable. A breath of fresh air considering the sea of copycats and clones.